INTERCITY Express Trains built by Hitachi seem increasingly unlikely to enter service on the East Coast Main Line in December, following fresh revelations concerning the fitness of the trains. Problems with electromagnetic radiation have already been identified, although builders Hitachi and Network Rail have disagreed over whose systems are responsible for interfering with signals and axle counters on the East Coast route. While efforts to solve this problem continue, the Office of Rail and Road has identified another safety risk, which it says is posed by the electrical cable connectors between the cars. The ORR told Railnews that these could be climbed upon, and confirmed that further East Coast authorisations have been ‘paused’, although a number of Hitachi Class 800 and Class 802 sets are already running on Great Western. The ORR has now ruled that similar mitigation must be achieved before IETs can be allowed to run in public service on the East Coast route. The first Hitachi ‘Azuma’ sets had been scheduled to enter service on East Coast with the timetable change on 4 December, having already been delayed, but one industry source admitted to Railnews that getting all the problems solved within the next eight weeks would be ‘challenging’. Both Hitachi and operator LNER maintain that their plans to introduce the trains are ‘progressing’, while GWR said its versions of the new trains are continuing to enter service as replacements for the long-serving HSTs. 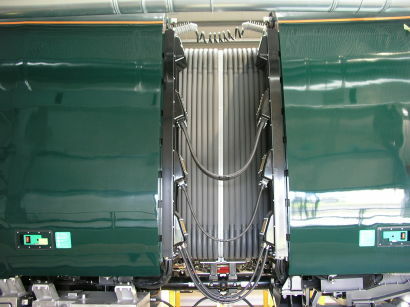 A spokesman for GWR said its new Hitachi trains were currently timetabled to run in HST diagrams, so that either type of train can be used for the time being. The latest problems on East Coast are only another chapter in a series of problems affecting Hitachi trains, which have included air conditioning dripping on to passengers, complaints about doors failing to open and, more recently, a brake pipe failure which left passengers on a Class 802 stranded near Exeter for five hours. Meanwhile, the first three examples of Hitachi Class 385s have been suddenly withdrawn from service in Scotland, having only been introduced recently between Edinburgh and Glasgow Queen Street. It is reported that a brake fault has been identified.